DVD recorded live on July 2nd 2005 at Pont Du Gard (France) (20th anniversary of its inclusion of UNESCO's world heritage list). “There have always been so many questions put forth about just who we humans are and how we got here. Seemingly shipwrecked on gigantic floating rocks we call continents, humans have pondered these questions since the realisation of our own existence. The more we explore these questions, the more we must ask ourselves the single most important question: the question of 'why?'. Why are we here? Are we here by design or by consequence? In our busy lives, we have the few chances to occasionally look up into the blue sky. When we do, the sense of our world of blue ends when the blue fades to black (or is it really black?). There are a few of us who believe the opposite, that the human life begins just past the border of our imaginations. Whichever way you hold the truth, one thing is a commonality, we believe the answer lies beyond ourselves. So the questions persist. This first DVD from Tresor represents a historic moment in the history of techno music. 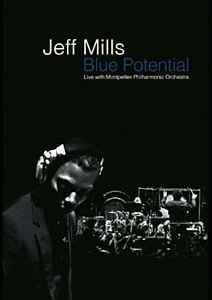 In July 2005 Jeff Mills performed a single live outdoor concert with the Montpellier Philharmonic Orchestra, at the foot of the Pont du Gard bridge in southern France, a World Heritage classified site. Symphonic versions of Jeff Mills’ greatest works were performed for the first time with the 80-piece, classical orchestra, conducted by Alain Altinoglu. This also represented Mills’ first live performance/collaboration since 1991. The exceptional works by Mr. Mills were arranged and adapted by French composer Thomas Roussel, after having previously approached Jeff about the project. Fifteen works by the legendary techno music composer and producer were performed at the concert under the stars, many compositions stemming from his early ground-breaking days in Detroit, creating some of techno music’s most memorable tracks. During rehearsals, the Montpellier classical musicians were astonishingly keen to manifest the project, and after the first day of acclimating to the unusually contradistinctive style, an immediate musical communion between Mills, Roussel and the musicians was established. The exhilaration of the project only gained more momentum as the rehearsals progressed. The final result was indeed a marvellous creation of something new, with Jeff Mills playing percussion and drum machine in order to recreate sounds not possible for an orchestra, and the orchestra adding an organic impact that is not usually found in electronic music. This blending of two worlds has been remarkably documented on this DVD, complete with the full concert, a “making of” documentary, a studio tutorial and an interview with Jeff Mills. It is only fitting that Tresor would release its first DVD in Germany with this incredible Jeff Mills-tailored design, the artist who was the first to be represented on the Tresor label in 1991. Included in the concert are the full, melodic pieces “Imagine” and “The March”; the deep, classic techno piece “Gamma Player”; selections from Jeff Mills’ film compositions “Entrance To Metropolis” and “Keaton’s Theme”; the avant-garde and sublime 14-minute piece “Medium C”; and lastly the unforgettable dance floor masterpieces “The Bells” and “Sonic Destroyer”.